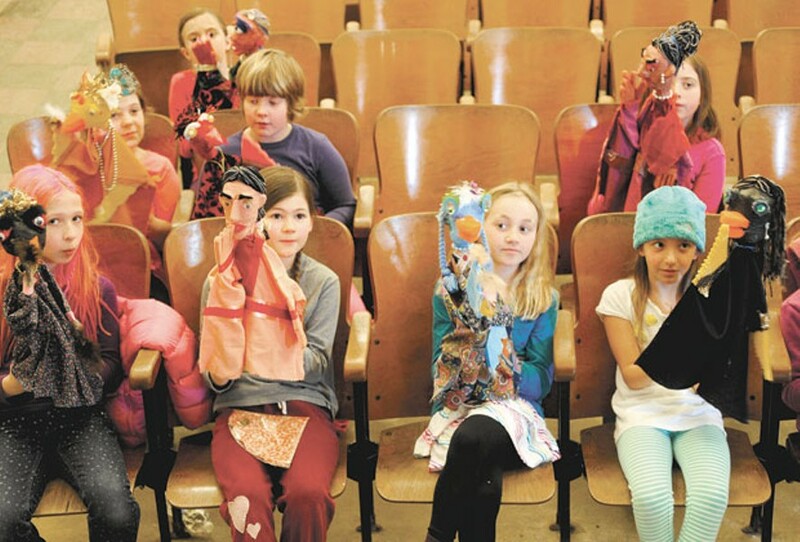 The Art Of... Puppetry | The Art Of | Kids VT - small people, big ideas! Schools and parents can arrange a workshop with Dan Baginski and Barbara Paulson by calling 877-STRING-1. For varying prices, they offer in-school residencies, after-school programs, festival demonstrations, short workshops at their Randolph studio and a "backstage pass" that gives kids an in-depth, behind-the-scenes experience after performances. 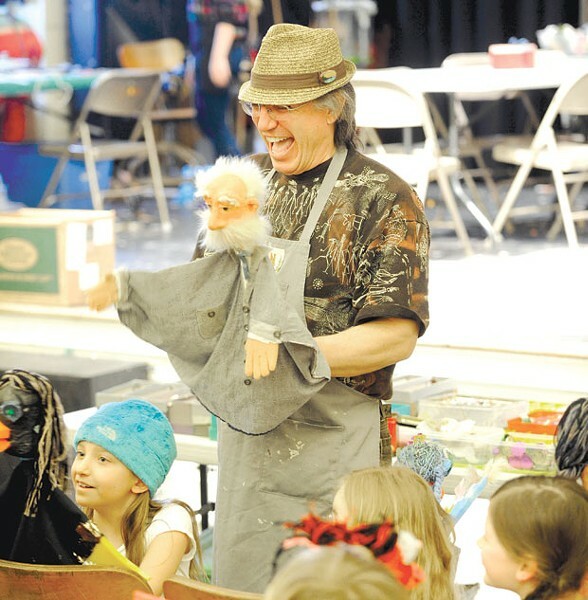 As the No Strings Marionette Company, Baginski and Paulson regularly tour New England performing a repertoire of 10 shows, each of which ends with a Q&A session, allowing young audiences a closer look at the puppets and sets. The troupe's next public performance is Wasabi: A Dragon's Tale on June 22, 6:30 p.m., at the Old Town Hall in Brandon. Visit nostringsvt.com for more information and other upcoming show dates. Sixteen smocked third graders were restraining themselves. Seated on the small stage at Montpelier's Union Elementary School, they gazed at the paintbrushes they longed to hold as Dan Baginski finished his brief lecture on adorning the puppet heads before them. "I always start upside down and paint the chin," explained Baginski, who is one half of the Randolph-based No Strings Marionette Company; the other half is his wife, Barbara Paulson. Over the years, the couple has taught countless Vermont children, in preschool through high school, to stage their own puppet performances. Their artist-in-residence program brings them to schools for everything from three-day sponge-puppet workshops to "the full monty" — a three-week residency. This is day three of the latter, an annual tradition at the Montpelier Union school for the last 10 years. Preparations for the workshop were extensive — starting with the story selection. To enhance her unit on world cultures, third-grade teacher Emme Erdossy chose the Japanese tale "The Tongue-Cut Sparrow." The fable tells of a kindly man who heals an injured sparrow, his greedy wife who cuts off its tongue for stealing food, and the reward and retribution the sparrow's family deals each. "We as teachers can pick any story that we really like," says Erdossy. "Barb has never said, 'That's impossible.'" Paulson turned "The Tongue-Cut Sparrow" into a script, increasing the character list with neighbors and an extended sparrow family to create a speaking part for each student. Throughout No Strings' residency, the students papier-mâchéd, painted, assembled and decorated their puppets, raiding the couple's "treasure" boxes of fabrics, sequins, buttons and more to create them. Baginski and Paulson helped the children make simple rod or stick puppets rather than marionettes. Wielding a paintbrush, student Maddie Lapera coated her puppet, the sparrow's wife, in black. Nearby, Sonya Sagan-Dworsky proudly showed off what she called "frowning eyebrows" on her character, the evil neighbor-woman Magumi. "They get really invested in their puppets," Paulson said of the children, "maybe because, in the end, you're bringing something to life." In the next weeks, the kids also practiced their lines, honing enunciation and reading skills in the process. Then Baginski recorded them reading the script, so the students could focus on manipulating their puppets during the final school performance. "The most amazing thing is to see how the students respond when the audience reacts to what they're doing," says Paulson. "They almost levitate off the floor, they get so excited."